What better way to kick off the Grand National and World Championship Morgan Horse Show! 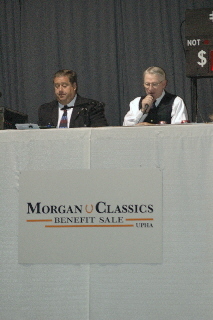 The first-ever Morgan Classics Benefit Sale was held in Oklahoma City on Friday evening, October 7, prior to the start of the horse show on Saturday. The sale was the brain child of a group of dedicated Morgan Horse devotees who wanted to provide, not only a marketing venue for quality horses, but also give back to the Morgan community. Proceeds from the sale will be paid back through the Regional and National UPHA Morgan Classics classes. The evening’s festivities began at 5:00 p.m. with hors d’oeuvres, cocktails, and live music courtesy of Dabora, Inc. The sale started at 6:00 p.m. with a large crowd filling the Made In Oklahoma building on the Oklahoma State Fairgrounds adjacent to the show facility. This sale was a golden opportunity to purchase world class show horses, prospects and breeding horses. With auctioneer Bill Addis and pedigree reader Peter Fenton atop the sale podium, the action commenced. A lively crowd followed the 37 horses that sold to new owners during the evening. The average selling price for the top six horses was a nice average of over $11,000 with the top ten coming in at just shy of $9,500. 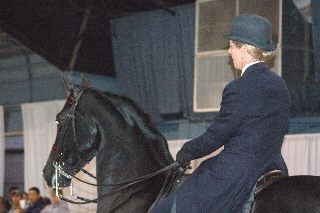 The high selling consignment was Tyra, a four-year-old mare sired by High-Y Black Tie. 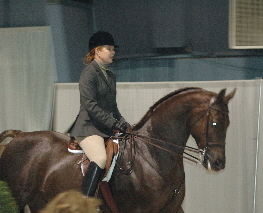 The athletic bay was consigned by Kim Weed and presented by Stacy Hennessy. Teresa Reiter of Arlington, Wash. signed the ticket for $21,500 on her purchase. The second high seller of the evening was the multi-titled IGF Coeur Et Ame who will be returning to Lowry Stables as Jim and Fay Lowry had the final bid of $10,700. The proven driving champion was presented through the sale under saddle by Jenny Taylor for former owner Donna Zimmerman. The sharp black gelding Stonecroft Superstition brought a bid of $10,000 from new owner Janet Lindeberg of Ft. Collins, Colo. Stonecroft Farm consigned the youngster who was presented by Diana Rannells. Chintimini Bravo Charlie will make his new owner an outstanding junior exhibitor hunter mount as Garn Walker signed the ticket for Lizzie Holmes. 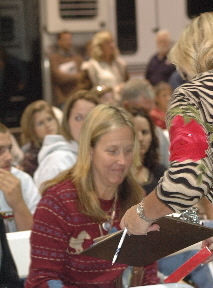 Jennifer Chowning presented the Pamela Engblom consignment who earned an $8,800 bid. A pair of $8,000 bids came in back to back lots to round out the top six selling horses on the night. The expressive Cyderbay Sassafras will be going home with Susan Ellis as she signed the ticket on the Merriehill Chicagoan daughter consigned by Margaret Van Meter with Triumph Stables as agent. SPR Don Juan will go home to Michigan with David Earehart of Liberty Stables. The winning hunter gelding sired by Man About Town LPS was bred and consigned by Stove Prairie Ranch. The sale organizers were pleased with the results of the inaugural event and feel certain that the sale will produce an additional $15,000 to $20,000 for the UPHA Classics program. With this year's sale complete, plans are already underway for next year.